Would you like to show off your property at night as well as during daylight hours? If the answer is yes then you should talk to us about installing landscape lights. At Design West Landscape we have a team of lighting professionals ready to take your home or business to the next level with the addition of a lighting scheme. We have been serving the Northern San Joaquin Valley and East Bay area of residential and commercial clients for many years. Our landscape designers have extensive experience and really know how to enhance your landscape settings. Outdoor landscape lighting is just one of the many ways to highlight your beautiful property and all of its elegant features. When you hear the term 'low voltage landscape lighting' it is basically referring to a range of lights that are low in power consumption. This characteristic is obviously a very popular and enticing factor for home and business owners looking to reduce costs. 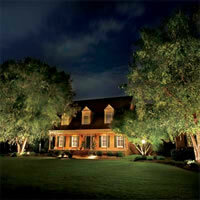 You can still have the same great effects of outdoor lighting but with significantly lower costs on your utility bills. There is no wonder that these lights are becoming the number one choice for all landscaping applications. Let the team at Design West Landscape help you choose the appropriate lights for the various areas of your landscapes. What does LED stand for? Light Emitting Diode! Still not making sense? Well LED lights are basically light fixtures that are low in voltage, wattage, and amperage and energy consumption. Not only do they possess all of these great qualities but they also make any landscape setting come to life at night. 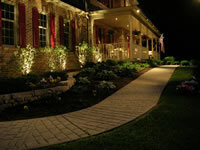 LED Landscape Lighting installation is our specialty here at Design West Landscape. We pride ourselves on providing our clients with greener solutions for their lighting needs. LED lights are widely used in both residential homes and for commercial businesses. They will enhance the look of your property and last a very long time. Whether you are looking at installing outdoor lighting for the purpose of aesthetics, safety or increased security; the team at Design West Landscape is the right company for you. Our experienced lighting contractors will install the right type of lighting for your particular applications. So, don't hesitate to contact us today and we will provide you with a personal consultation!